Charles Rick retired in 1985. Charles Rick, a plant geneticist and botanist recognized by many as the world's leading authority on the biology of the tomato, died Sunday in Davis. A professor emeritus, he was 87. His family is planning a June open house in his honor for friends and colleagues. In accordance with his wishes, no formal services will be held. Something of a modern-day Charles Darwin and Indiana Jones combined, Rick was equally at home in the classroom, greenhouse, laboratory and field. His research expeditions took him from the Galapagos Islands to high in the Andes, where he criss-crossed rugged terrain to collect hundreds of wild tomato species. These wild species contained a wide range of genetic variation that was missing from the modern domestic tomato. During his career, he made landmark contributions in the areas of plant genetics, evolution, genome mapping and archiving the seeds of tomatoes and related plant species. In 1967, he was elected to the National Academy of Sciences, one of the highest honors for research scientists. "Among his colleagues, Rick was considered the quintessential scientist," said UC Davis professor John Yoder, chair of the Department of Vegetable Crops. "His passion was learning and discovery, not fortune or fame. He had a contagious enthusiasm for biology that impacted and motivated all who knew him." Born in 1915 in Reading, Pennsylvania, Rick grew up working in orchards and participating in nature studies through the Boy Scouts. He earned a bachelor's degree in horticulture in 1937 from Pennsylvania State University, and later earned a doctoral degree in genetics from Harvard University in 1940. He came to UC Davis in 1940 as a faculty member in vegetable crops, launching a career that would span some sixty years. His studies of sterile tomato plants led him to construct a genetic "linkage map" that pinpointed the locations of many mutant or variable genes on each of the tomato's twelve chromosomes. It was the beginning of his pioneering effort to map the tomato’s entire collection of genes, now known as its genome. Rick's early work laid the foundation for molecular maps that today make the tomato genome one of the best-mapped plant genomes. His efforts to identify the genetic basis of resistance to the nematode – a tiny worm pest – made it possible to develop nematode-resistant tomato varieties. Because the tomato has been so well characterized genetically, it now serves as a research model for plant scientists and can be more readily modified for commercial use. Rick's research helped advance the understanding of the relationship between the geographic distribution of plant species and their ability to crossbreed with each other. 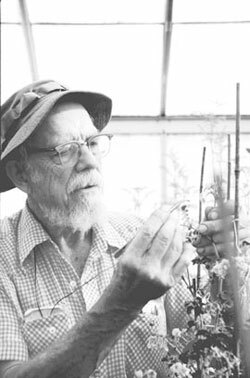 In 1949, Rick co-founded the Tomato Genetics Cooperative to encourage tomato researchers to communicate their findings and exchange information. He also established and served as curator for the Tomato Genetics Resource Center at UC Davis. Renamed the Charles M. Rick Tomato Genetics Resource Center in 1990, the center is the largest known collection of tomato seeds in the world. A scholarship fund is being established in Rick's memory that will help support South American students and scholars interested in promoting biodiversity in the Andes. Contributions should be made payable to the Charles Rick Scholarship Fund and sent in care of John Yoder, Vegetable Crops, University of California, One Shields Ave, Davis, Calif. 95616. Dateline UC Davis is the faculty and staff newspaper for the University of California, Davis.